During the course of the thirty or so air raids on London between May 1915 and May 1918, the worst incident of those killed and injured by a single bomb took place in the City of Westminster on the night of 28/29 January 1918 when a 300kg high explosive bomb fell on the Odhams Printing Works in Covent Garden. 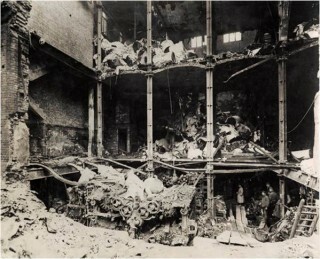 Just over five weeks later, one more incident in the City of Westminster made headlines on both sides of the Atlantic when on the night of 7/8 March another R.VI “Giant” dropped a 1000kg bomb on a residential area of Maida Vale, then in the London Metropolitan Borough of Paddington but today in Westminster. 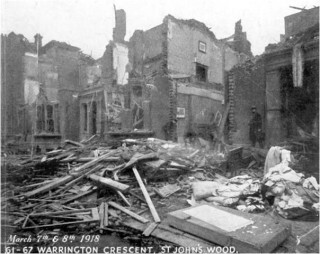 The massive bomb destroyed four houses and caused serious damage to many more in Warrington Crescent with casualties amounting to twelve killed and thirty-three injured. Two of those killed were the American poet and lyricist, Lena Guilbert Ford, and her son. Poignantly, Mrs Ford was the person who had written the words to one of the most popular songs in the English-speaking world during the First World War, Ivor Novello’s “Keep the Home Fires Burning” and mainly because of this, and the fact that she was a U.S. citizen, her death received much coverage in American newspapers. Of course, the sort of fires which burned in Maida Vale that night, Long Acre in January and other parts of Westminster and London as a whole, 1915-1918, were not the type that Ivor Novello and Lena Guilbert Ford had envisaged in their famous song. This page was added on 19/07/2014.